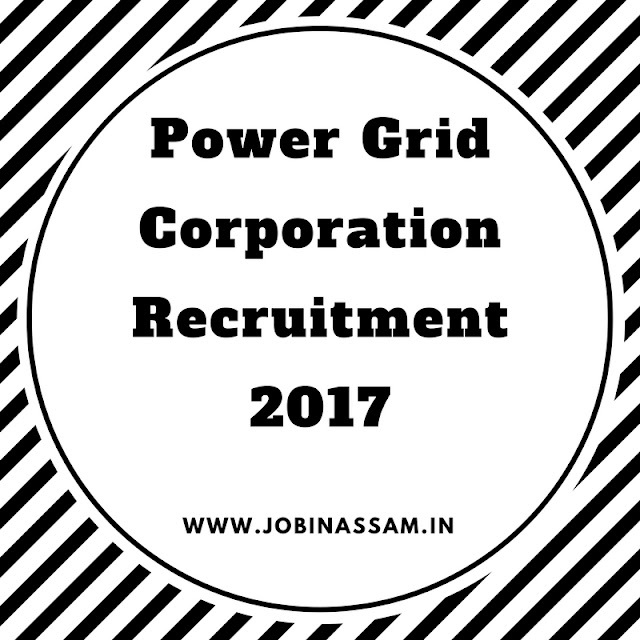 If you are looking for a job in Assam, here is the good news for you.Power Grid Corporation has published a notification regarding their latest Recruitment in various posts by Power Grid Corporation Jobs in Assam 2017. Power Grid Corporation invites people to fill up application for the following posts. BE/B.Tech/BSc(Engg)/AMIE in Electrical/ Electrical(Power)/Power Systems Engineering or equivalent with at least 60% marks or equivalent CGPA from recognized Institutes/ University. M.Tech or Ph.D. in Power System Analysis or Power System Engineering is desirable. Graduate from a recognized University / Institute. Other Qualification- Degree in law. Degree in Law or CA or ICWA is desirable. These posts are advertised by Power Grid Corporation to recruit eligible candidates for their department. You can apply for the post if you have the eligibility mentioned above. Process of Application- Interested eligible candidates should apply ON LINE only. Any other mode of submission of application would not be accepted. Candidates have to register themselves online at CAREER section of POWERGRID website www.powergridindia.com. Candidates will have to upload their latest colour passport size photograph (.jpg file size not exceeding 50 kb) and scanned copy of signature (.jpg file size not exceeding 30 kb). Candidates will have to upload the following documents in PDF format. a. Experience Certificate in chronological order (for Present as well as Previous employment indicating start date, end date, designation, pay scale/ emoluments & area of experience). Do not include trainee level / teaching/ pre -qualification experience. b. Duly certified pay slip/ pay certificate for June 2014, June 2015, June 2016 & June 2017, as the case may be in support of experience in relevant pay scale/ emoluments/ equivalent level for the duration concerned. Candidates working in PSU/ Govt. organisations must attach proof of pay scale & level. c. Candidates working in Govt. Department/ organization must produce certificate that they are holding gazetted post. Address of the Recruiter- www.powergridindia.com. I have shared all the important knowledge for the upcoming Power Grid Corporation Recruitment here. This is completely free service for from me. Power Grid Corporation will be a good job for you if you are eligible for the post mentioned above, apply before the last date. Monthly pay for the Power Grid Corporation job is also good.